Calculated Risk had an interesting post last Saturday about Refinancing with Negative Equity. He has given up on the possibility of refinancing and is trying for a loan modification. If that does not work, there is one more solution: walking away from his home. “We’re a flight risk,” he said. Unfortunately David Streitfeld doesn't provide any further information on Belvedere's loan. If the loan was held by a bank, then it might make sense for the bank to refinance the loan (this lowers the bank's risk of default). However Belvedere's "lender" might be a servicing company and the loan may have been securitized. Then it is impossible to refinance because the current holders of the note would be paid off, and no new lender would make a loan greater than the value of the collateral. The New York Times article digs into few pertinent facts but here are the clues the loan was securitized. The loan was an adjustable rate loan, one that could go as high as 12%. That smacks of subprime. Most adjustable rate mortgages from 2005 should have long ago adjusted dramatically lower automatically unless he was a high risk (subprime) borrower with a huge spread over the loan index. Inquiring minds are reading a Federal Reserve Bank of Philadelphia working paper on mortgages made between mortgages from 2003-2007: Securitization and Mortgage Default: Reputation vs. Adverse Selection. securitization’s contribution to the poor performance of mortgages originated in the run-up to the current crisis. Theoretical arguments have been advanced on both sides, but the lack of suitable data has made it difficult to assess them empirically. We examine this issue by using a loan-level data set from LPS Analytics, covering approximately three-quarters of the mortgage market from 2003-2007, and including both securitized and non-securitized loans. We find evidence that privately securitized loans do indeed perform worse than similar, non-securitized loans. Moreover, this effect is concentrated in prime mortgage markets. For example, a typical prime ARM loan originated in 2006 becomes delinquent at a 20 percent higher rate if it is privately securitized, ceteris paribus. 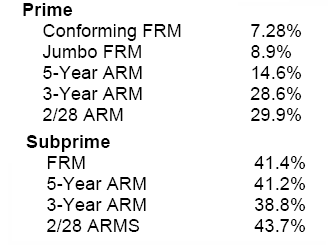 By contrast, subprime loan performance does not seem to be worse for most classes of securitized loans. Using a data set that covers approximately 75 percent of loan originations from the years 2003-2007, and that includes private securitized, GSE, and mortgages held in portfolio, we have shown that prime private securitized loans originated at the peak of the bubble performed significantly worse than similar, non-securitized, loans. The results are particularly striking for markets such as prime ARMs, in which issuers held non-negligible amounts of loans in portfolio. This suggests that adverse selection may have been present in the prime mortgage market, and that it may have contributed to a deterioration in underwriting standards. As one might expect, subprime loans were bad across the board. However, the article states there was little difference between securitized loans and non-securitized loans. Interestingly, securitized prime loans fare worse than non-securitized prime loans. The above table shows how wrong it is to blame this problem entirely on "Subprime Lending". Lending standards in general were the problem. As noted above adverse selection is a major contributor to the problem. Adverse selection can more appropriately be called cherry picking or "Pass The Trash". A quick look at the following tables shows further intent of originators to "Pass The Trash"
The above table shows that a whopping 84.1% of subprime (trash by definition) was securitized. Of prime mortgages, 22.4% were securitized and a mere 9.3% remains in bank portfolios. 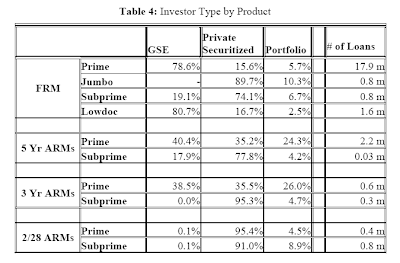 59.3% is in the portfolios of the GSEs (Fannie Mae, Freddie Mac). The Home Affordable Refinance Program (HARP) can help borrowers whose loans sit with the GSEs, but only up to 125% of the loan, and even then only for those who haven’t been more than 30-days late on your mortgage payment in the last 12 months. Pray tell what percentage is that? Banks will need to take “substantial” writedowns on home-equity loans to enable loan modifications that will allow the U.S. housing market to recover, according to Amherst Securities Group LP. The government’s mortgage-modification program will fail to avert many of the 9 million to 10 million looming foreclosures because it doesn’t reduce principal for borrowers, about a quarter of whom owe more than the current values of their houses, Laurie Goodman, a New York-based mortgage-bond analyst at Amherst, said today in a Bloomberg Radio interview. Bond investors such as BlackRock Inc. and Fortress Investment Group LLC have criticized the treatment of home-equity loans under the Obama administration’s $75 billion Home Affordable program, citing in part the potential conflicts of interest that banks such as Wells Fargo & Co. and Bank of America Corp. have in acting as both first-mortgage servicers and owners of second-lien debt. Through November, U.S. lenders permanently modified 31,382 of as many as 4 million mortgages targeted by the Home Affordable program, the Treasury said Dec. 10. As many as half of “at-risk” homeowners have second mortgages, the department said in April. U.S. banks held $855 billion of home-equity debt, including closed-end second mortgages and amounts drawn from revolving credit lines, as of Sept. 30, according to Federal Deposit Insurance Corp. data. $855 billion is a lot of conflict and a lot of interest. Given the conditions on HARP, the cherry picking of prime loans by the lenders, the huge amounts of negative equity on loans made during the boom, and second mortgage conflict of interest situations, one should not be surprised to see lots of people complaining about not being helped. Moreover, the harsh reality is neither the Fed nor the Treasury cares much if the securitized loans blow up. Those securitized loans are sitting in the hands of pension plans, hedge funds, foreign and domestic investors, and the hands of other fools that bought the trash. Securitized loans are a problem for investors not banks, except of course for home equity lines of credit sitting on top of the mortgage, creating additional problems for banks (and for anyone expecting the bank to work out a deal for them). If you are underwater or securitized, or if you have a home equity line, you are likely screwed. If you need help you are not going to get it. That especially applies to anyone whose mortgage exceeds 125% of home value. If you are underwater, securitized, and screwed, why not help yourself? A Christmas Jingle can explain how. One final point ... Don't place all the blame on the lenders. Individual greed was certainly a big part of this problem. However, individuals have every right to do what is in their best interest right here, right now, and that includes walking away.